Investigators studied the exhaust emissions of a one-cylinder engine (Brinkman, 1981). The SAS data set Gas contains the results data. The dependent variable, NOx, measures the concentration, in micrograms per joule, of nitric oxide and nitrogen dioxide normalized by the amount of work of the engine. The independent variable, E, is a measure of the richness of the air and fuel mixture. 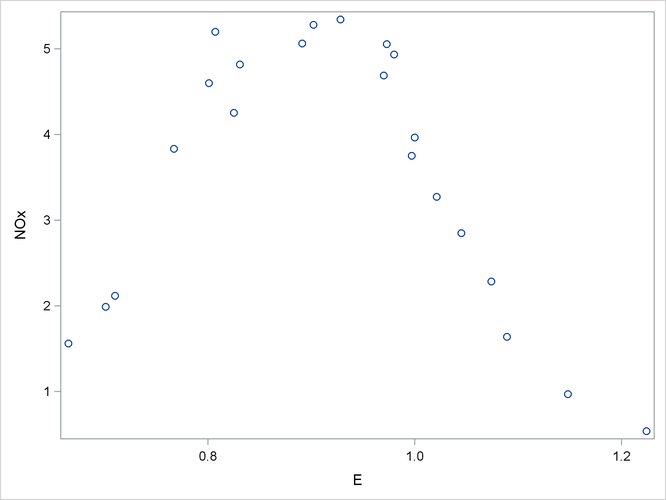 The following PROC SGPLOT statements produce the simple scatter plot of these data displayed in Output 57.1.1. The following statements fit two loess models for these data. Because this is a small data set, it is reasonable to do direct fitting at every data point. As there is substantial curvature in the data, quadratic local polynomials are used. An ODS OUTPUT statement creates two output data sets containing the “Output Statistics” and “Fit Summary” tables. The “Fit Summary” table for smoothing parameter value 0.6, shown in Output 57.1.2, records the fitting parameters specified and some overall fit statistics. See the section Smoothing Matrix for a definition of the smoothing matrix , and the sections Model Degrees of Freedom and Statistical Inference and Lookup Degrees of Freedom for definitions of the statistics that appear this table. The “Output Statistics” table for smoothing parameter value 0.6 is shown in Output 57.1.3. Note that, because the ALL option is specified in the MODEL statement, this table includes all the relevant optional columns. Furthermore, because the ALPHA=0.01 option is specified in the MODEL statement, the confidence limits in this table are 99% limits. The combination of the options SELECT=AICC and SMOOTH=0.6 1 in the MODEL statement specifies that PROC LOESS fit models with smoothing parameters of 0.6 and 1 and select the model that yields the smaller value of the AICC statistic. The “Smoothing Criterion” shown in Output 57.1.4 shows that PROC LOESS selects the model with smoothing parameter value 0.6 as it yields the smaller value of the AICC statistic. With ODS Graphics enabled, PROC LOESS produces a panel of fit plots whenever you specify the SMOOTH= option in the MODEL statement. 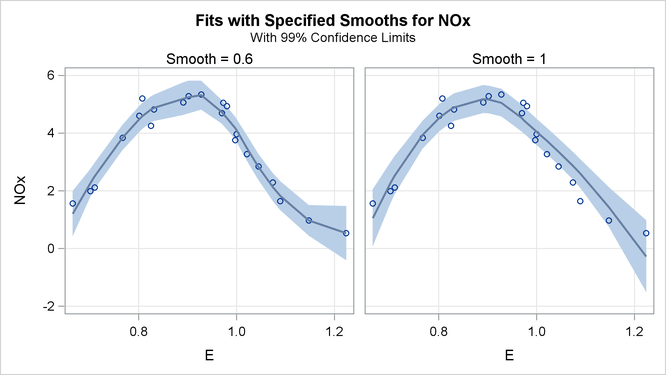 These fit plots include confidence limits if you additionally specify the CLM option in the MODEL statement. Output 57.1.5 shows the “Fit Panel” that displays the fitted models with 99% confidence limits overlaid on scatter plots of the data. Based on the AICC criterion, the model with smoothing parameter 0.6 is preferred. You can address the question of whether the differences between these models are significant using analysis of variance. You do this by using the model with smoothing parameter value 1 as the null model. numerator degrees of freedom and denominator degrees of freedom (Cleveland and Grosse, 1991). Here quantities with superscript n refer to the null model, rss is the residual sum of squares, and , , and are defined in the section Statistical Inference and Lookup Degrees of Freedom. The results are shown in Output 57.1.6. The small p-value confirms that the fit with smoothing parameter value 0.6 is significantly different from the loess model with smoothing parameter value 1. Alternatively, you can use the OUTPUT statement to generate the statistics you want to include in the output data set. The following statements produce essentially the same results as the ODS OUTPUT statement does, except all the statistics for each of the two smoothing parameter values are included because the SELECT= option is not specified in the MODEL statement. In addition, with the ROW option specified, the output data set is arranged in rowwise format which enables you to compare statistics side-by-side for a sequence of smoothing values. The ALL option after the slash produces all the statistics (predicted values, residual values, standard errors of the mean predicted values, t statistics, and the lower and upper parts of % confidence limits on the mean predicted value). All these requested statistics are given their respective default names in the output data set except the predicted value. The P=PREDVAL option causes the name for the predicted value to start with predval.